I have waited a long time for this series, no no it is not just a series, I have waited a long time for this spectacular event to come round and the wait is finally over. As I write the typical British weather may get in the way on the first day with rain forecast down in Cardiff but I remain positive despite this. This is the most eagerly anticipated Ashes series ever. The cricket fans will be coming out of the woodwork over the coming weeks and did you realise that their could potentially be 25 days play out of the next 40 days. Amazing. Each test match will begin daily at 11am. I like my stats and I do agree form can be thrown out of the window in contests of this magnitude. It is about who turns up, who can handle the pressure and who gets that little bit of luck on the day. But they do make for interesting reading. Since the delights of 2005; England have played 47 tests winning 15 with a win to loss ratio of 0.93 and in that time they used 32 players. Australia have played 38 tests winning 27 of them with a win to loss ratio of 4.50 and in that time they have used 37 players. Significant? Who knows. Australia are currently ranked number 1 in the world with England down in 5th place but they built up their ranking points with a dream team, they come to these shores with a much changed team. Both teams obviously possess world class players and names easily fall off the tongue that would make any world XI. But this series will be about much more than the big names, it surely has to be. Spin. For the first time in a long time there is no Shane Warne and they haven’t replaced him. England appear to have a few more premium spin choices. Cardiff will be the the first sign of this battle. Win the spin contest, you could win the series. Glove Work. Long gone are the Gilchrists and Stewarts of the game. Both are Ashes debutant’s and both are better batsmen than wicket-keepers. Strong keeping will be vital to the success of the fielding teams. Captaincy. The old and the new. Two top men and two tough characters. Key decisions will prove vital in this series and it will either boil down to old and safe versus fresh and new. 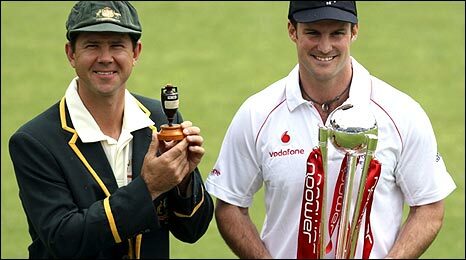 As mentioned the captains are vital in this series but they both have to turn up and bat, something Ricky Ponting hasn’t done for a while and he will be the first to admit to this, whereas Andrew Strauss is in form though against some lesser opposition. You can follow the series live daily on Sky Sports, with highlights nightly on Channel 5, check listings for details. Also you can listen to Test Match Special on BBC Radio 5 live sports extra or on BBC Radio 4 Long Wave. As you are aware by now I like to give you my tip for some of the sport I write about. Well it gives me a feeling of warmth inside so let me get on with it please. My tip is that the series will be won 2-1 by either side and with that in mind it’ll probably end a draw. Oh and if you have chance I came across this quirky band who are fronted by Neil Hannon (Divine Comedy). Oh and I’m not bias but come on England. P.s. Well done to both Mark Cavendish and Bradley Wiggins for their excellent starts in this years Tour De France. Cavendish has won to stages thus far and Wiggins is in 5th place overall.